Join us in historic downtown Newburyport as we celebrate the fabulous 50's! The Downtown will be transformed into a summer night set in the era. Visit our renowned restaurants, unique shops and historic sites featuring special events and 50's pricing. Music of the era will fill the downtown streets and classic cars will be displayed on State, Pleasant and Inn Streets. Sponsored by WNBP Radio "THE LEGENDS." WNBP will be broadcasting live on the air and on WNBP.com. The event wraps up with dancing and a free outdoor concert on Market Square by local favorites Billy D and the Rock-its from 7:15-8:00pm. 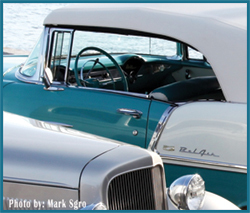 Classic car registration has closed for 2013 as participation is sold out.